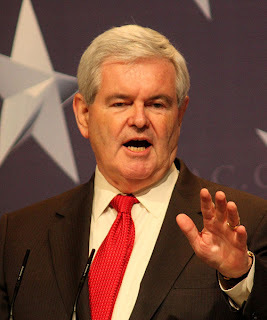 Poke Salad Granny: Newt Gingrich tells Granny, "I'm too big to fail." Newt Gingrich tells Granny, "I'm too big to fail." "Well, I know he's busy, but he shouldn't be too busy to talk to Granny. Put him on the phone." I tell you that boy just keeps getting too big for his britches, and it's gonna get him trouble one day, I was thinking as I waited for my grandbaby to get around to talk with me since he's been looking to be President. "Oh, granny, it's been so busy for me since I started my campaign for President. You know I got these interviewers from the media, you know those left-wing radicals trying to do me in. But I tell them I'm too big to fail. ", and I have to wonder if that child ever listened to me back in Cloutierville. "Newtie (I calls him by his baby name cause he's always gonna be my baby no matter how big those britches get) nobody is too big to fail. In fact, that's where our lessons come. You betcha you can fail. You have failed already by not taking care of some of that business right in your own family. You been making with all that talk about Obama and bailing out those banks and all, but that's all talk when your neighbors they is suffering; and you ain't looking at your own mistakes. I remind my grandson of all those times we talked about this, walking down the streets of Cloutierville when he was still knee high to a grasshopper. Guess some folks, they don't listen when you tell them you need to learn from your mistakes. I hear him talking to someone, and I wonder where his mind is, where his heart is, when he ain't listening anymore to what his Granny says. I shakes my head and wait awhile, then hang up that darn phone, wondering how politicians ever get to heaven when they can't figure out those who think they are too big to fail are the ones who will keep failing most.